As a renter myself when I run across a home that I find to be amazing and then find out that it is a rental I get a little giddy inside. 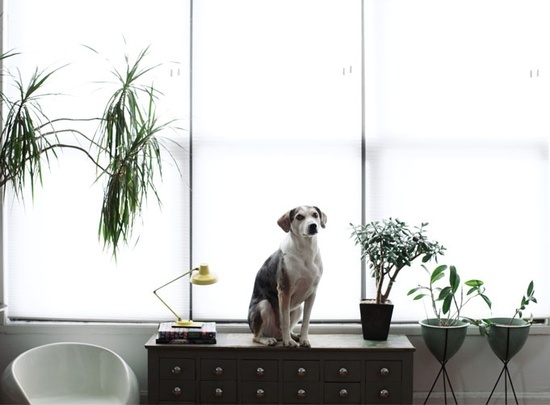 This gorgeous home belongs to Bladon Conner, a furniture maker and designer, who owns Bladon Conner Design Studio in Chicago. 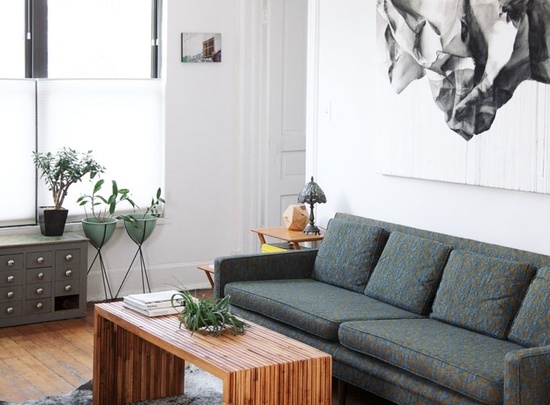 As soon as I found this interview and house tour over at Rue Mag I immediately feel in love the strong masculine feel and clean lines which is so beautifully adorned with all the lovely plants, warm woods and soft hues of green. 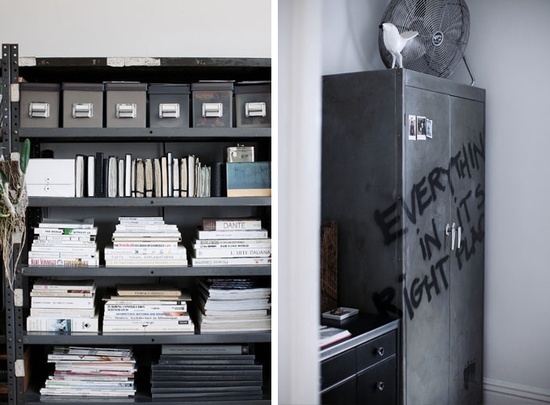 I loved reading that so much in his home he has either designed himself or refinished second-hand finds. That cute little doggy caught my eye too - I can't believe how still he held for that picture! I like this place! It has a strong personal touch, you can really feel that someone is living there and you can tell about this persons interests. 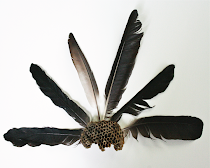 A creative place! 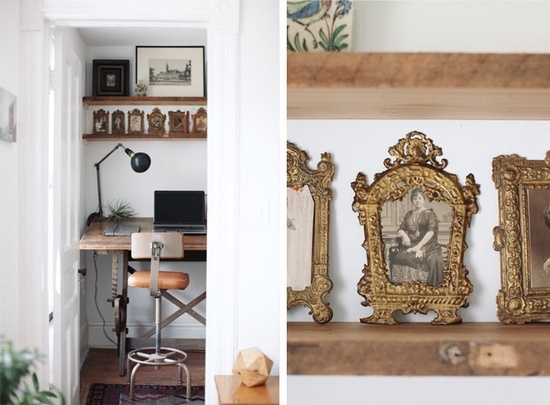 I think my favorite is the "office area", with the ornamented, golden frames. They stand out in the otherwise quite masculine interiors. i agree, i think those frames are such a show stealer. i wish i had such an eye for design. that balance is magnificent. So much light and green! I am looking at Chicago rentals from time to time to get a feel of what to expect If we move! I too love all the industrial and masculine touches! oooh, yes, that's right! hope you find something with lovely light like this one. when i moved into my place i didn't consider the lighting - woulda/coulda/shoulda, i love everything about it except for that it doesn't get enough light at all. You'd be surprised what a dog will do for a treat! Even Fitz will strike and hold a pose if you bribe him! Haha. I do like the apartment, it's nicely industrial and the light is great. But I could do without the graffiti on the wardrobe, even if it is a Radiohead quote. It just seems a little...spooky to me for some reason? Other than that...love. That wall of green in the kitchen is great! 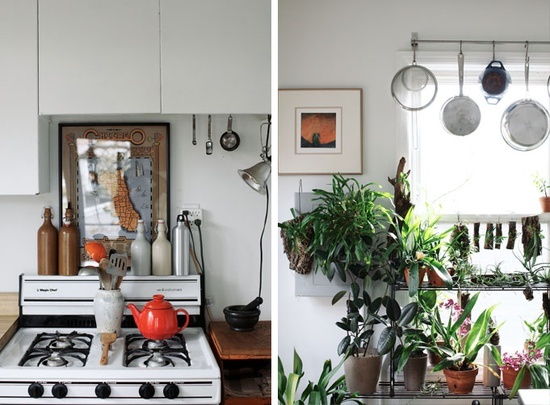 I love the lived-in-cozy feel that the home has with lots of plants and exposed cooking pans. Hmm, I wonder how MANY pics were to take of the dog before they got the perfect one - supermodel dog! i looooove the kitchen it looks like it is used and lived in, and i just love that in a kitchen. Those houseplants! So amazing. 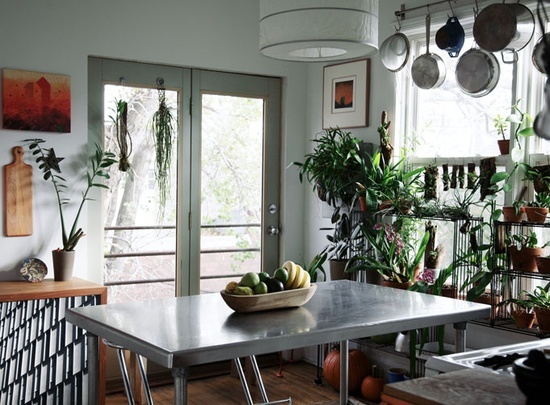 They transform a space so beautifully which is why I want to become a houseplant hoarder. You can never have too many. I love all the greenery in this home. I definitely need more plants in our home. I've got one orchid and a fig tree that I somehow haven't killed yet. I'm almost scared to push my luck, but this home is reminding how nice plants make a home look. I'm also drawn to all the vintage pieces. This renter has a great eye. I like that his home is very masculine, but not a bachelor pad.